"Decent product life cycle management software but way too many hidden menus"
The only thing I like is the impact analysis feature. It lets me see what higher assemblies use my parts. It let's me finish my work but is very convoluted. Lost of hidden menus and features. Maybe is the fault of my employer that didn't train me well. I wish the search was more powerful (advanced search). Don't like the fact that there are different search templates. I have used PDMLink in the last and it works much better. I'm not sure if PDMLink it is compatible with NX but I think both CAD and product life cycle SW should be considered together when making a decision to acquire the software. Ease of use, feature rich and good integration between of both crucial for efficient usage of the engineering team's time. I use this sw to open CAD files on a remote server. It lets me create parts, assemblies, etc. I can collaborate with my team on the design. The software lets me open cad files so I can analyze the mechanical system I work in (measure part length, look at interference between parts etc). "Great functionality offering, very poor execution & implementation"
I like most of the release ("workflow") functionality, the ability to release similar items. While the hierarchical nature of items/records is very clunky, there's some value in that as well. Instability - items, perspectives and views getting corrupt, cache getting corrupt, Java crashing, est. Also, Java being a few versions behind what works with other Java-using tools is very inconvenient. The excessive complexity and lack of intuitiveness of use is a problem as well. All of these issues cause work productivity problems, which cause many man-hours of hidden cost and overall value reduction. Thoroughly review other alternatives, and if possible, do "test drives". Talk to both grass-roots users and administrators of all potential candidates before making a decision. It would be good to get both engineering and manufacturing personnel - the folks that do the work every day - to review candidate tools, which will help get truly valuable opinions as well as build concensus on whatever tool is decided upon. General engineering document control, life cycle management, etc. "Great system to control you CAD files and Engineering Product Changes"
The Active Work Space Interface is friendly and intuitive. No need to train end users. It manages a lot of CAD flavors and integrate with major ERP systems as well. The system is expensive for most of the small companies. For simple changes to the data model, e.g. add a new attribute or List of Values, you need a lot of effort and some times close all the end user sessions. Reuse product information like drawings, CAD models, etc. Reduce time publishing Product Changes to the hole Enterprise. Avoid Retyping bill of materials between systems. "Teamcenter & Vismockup application - A usefull tool for prodcut life cycle management !!" I have worked for various leading US based OEMs and most of the companies uses Siemens team center application. I truly recommend this software...its easy to learn, easy to use, easy to maintain your designs and also you could integrate it with CN (change notices) process. So, that it will work as a complete life cycle tool. Well...there are always some things which you would like to improve. I can't complain about this software but wish the possible improvements in 2 areas which is typically not in the hand of use. These are part of software installation team/IT. But as a user..i donot think, I worry about these. 1. You should have latest hardware/performance software. But again I believe..if you have latest laptops/computers with latest processors and better network..you could overcome this. I advise to implement team center if you are not already using it and can afford the software. It will be helpful specially if you are executing new product development projects and multiple team are interfacing on the same. Very helpful tool !! There are couple of benefits here..
1. You could integrate team center application with any CAD software like Creo, Solidworks or so on. It will enable you to open your designs in CAD software using Team center and then you could work on your designs and upload. 2.Here the other added benefits is...you could also refer the previous design versions which you saved in Team center for an particular part and reuse. You donot need to save local files. 3. Team center Vis Mockup application helps you to review the complete machine JT model which is pretty time consuming if you open the complete machine 3D model in any CAD sotware. I like that you can store all different types of data in one place, compared to usually having to open different programs for viewing different types of files. It's a bit confusing to get around. I'm pretty new to the program, and it may be the way my company stores the files and information, but I find it slightly difficult to navigate. It may be easier to take a tutorial to fully understand how the program interacts with the company's documents and saved files to be able to navigate faster and with more ease. I'm working in remediation of medical devices and it is helping me better understand components, previous revisions and the component history, and the relationship with other components. I've realized it's very useful to have all the different documents or analyses in one place, rather than having multiple programs open. Is so customisable but not everybody knows how, you will need program skills and Database knowledge. About the interface, is clear and clean, to final users there is not hard to find the buttons. The server installation is so complicated and only can be executed by a Siemens engineer. Put special attention to the database, grows so fast. Depending the number of users the LAN can be saturated. Is easy to organize, share consult information. You can audit the history of change from a design, document, assembly, etc. Includes Workflows that is a graphical way to track tasks. It pull the information to fluid all over the Company. "Master Data Analyst, I use it to create KCIDs for p/n and transfer and load into SAP"
It's pretty much straight forward for what you need to fill out to complete the task. It only takes a few minutes to transfer to SAP and I'm able to go back and edit and resend if needed. My teamcenter seems to crash alot. If a part is under certain Group I.D. 's we can't see them, we want to avoid duplicates and also be able to set up New ones correctly. When you transfer and there's an error it doesn't really tell you what that specific error is. It helps to properly code product p/n, create and load dwgs, sometimes it shows BOMS and see alternative id's. "A awesome to manage life cycle of products." Teamcenter has a great user interface and lot capability to manage large assembly and change management. Product can be configured multiple ways. Teamcenter can be customized to suit corporate process. It has 4 tier architecture to serve large group of users. Data can secured for ITAR and IP compliance. Graphics can be configured and viewed. Integrates well with lot of CAD softwares to manage cad data. Too complicated to implement. Lot of upfront work to get it going. Little inconsistency in performance. It is almost impossible to use as out of box product. Always needs to be customized. Make sure good team of internal people work vendor. Product change management. Product configuration management. Manufacturing data management. Easy of access to data by entire corporation. Concurrent design and development of product. Even at end of life cycle of product environment disposal compliance can managed. "Exceptional Optionality and Functionality, but Cluttered Design"
There are countless ways to configure the system to fit each user in the best possible manner. Allows for easy, global collaboration. The system can quickly become very cluttered, and (at my workplace) runs very, very slowly. Not sure if this is a Siemens issue, or workplace-specific one. We use Teamcenter in our new product introduction and quoting processes. It has instituted workflows for us to track and manage these processes, which has proved helpful. "Teamcenter for Engineering Company Project"
Teamcenter was a way for me to view and understand the overall design of Mars 2020 without having to open each part individually (which would crash my computer). It also really helps you find parts quickly and then open them as a part file from there. It was a little confusing trying to find a part and I don't think you could search for it. This is more for things with 200+ components, otherwise it was very easy. It's so much quicker and more organized than just using NX for the entire thing. It also allows you to see part revisions and drawings! I liked the new active space (AWC) consumer goes to assist with our fringe users who are not within the system everyday and i discover the capacity to change and convey work processes rapidly a genuine point of interest. I like siemens team centre but I am not really happy with the maintenance policies. you are continuously "improving" the software and the new version are not compatible with old versions, so we are forced to pay for the "upgrades". I would recommend this to other who are trying to consider teamcenter, but with a installation and using training. in my company we used teamcenter mostly to manage our designs and engineering analysis data. but if we part the compatibility reasons here, we mostly benefit from its capability of integration with CAD and CAE. "Amazing PLM Tool - very user friendly"
User friendliness, easy to installation compare to other PLM Tools which are available in market. 1. Custom handlers of Workflow are bit boring stuff for me (sorry to say that), Is it possible to add it through BMIDE. 3. Needlessly complex to administer. The best thing of Teamcneter is its BMIDE, which is very much user friendly. We are trying to implement the PLM in the supplier industry. "Sr. Director, Product Management "
Teamcenter is the full-range PLM system with very good multi-CAD design data management, BOM and configuration management. Capabilities of Project and Portfolio Management and Requirements management allow to address wide range of business processes and defectively manage engineering data. Teancenter is hard to implement. There is no pre-defined data models and templates. for business processes. Significant effort and investment requires to configure and customize Teamcenter to address vert typical business processes and workflows. Teamcenter doesn't offer proven cloud solution. I recommend Teamcenter to address multiCAD design data management with JT visualization and BOM management. Teamcenter has very good PLM platform capabilities for Supply-chain management and Requirements management. Shorten time for products design reviews and, as result, faster approval of preliminary designs, which allow to introduce new products to the sales much faster. Reuse of engineering parts using configuration management makes engineering projects cost much cheaper. performance, limitation on CAD integration over network. Exaction of changes on particular rev need to go through multiple workaround. yes, I truly Recommend teamcenter to other user. I know the version I am using is still have some performance issue. but the latest version is improved drastically as the specially the AWC (active workspace is the best). this will definitely reduce lot of maintains headache. It gives major of the solutions through Out Of The Box (OOTB).Under master-model concept, Since the model and part are now under separate items, it’s trivial to revise them independently; just revise one, but not the other. Its really hard to store drawings in Teamcenter. It has a very difficult approach to separate the data set in two files. Reviewing the drawing and model in 2 different workflow is not possible as they both are the same (This is something they need to really enhance) and also you cannot have independent revisions of the model and drawing under model-model concept In master-model concept, workflow takes an Item Revision as a target and then processes a review process for relevant attached datasets. Multi-detail drawings are probably possible to support, but it’d be an awkward setup. You’d have to figure out which model’s item revision contains the drawing, or have the same drawing dataset referenced by multiple item revisions, each one of which contains a different model dataset which is detailed by the drawing. "Not great for SMB Market"
It has many features and functions that are great on paper and in theory if you can ever successfully implement. Tedious installation process for setting up the clients with CAD integration. Horrible user interface, not intuitive at all. Talk with many other companies similar to your business about their experiences with the sofware. Have dedicated project team throughout the implementation. Develop a very strong training plan. 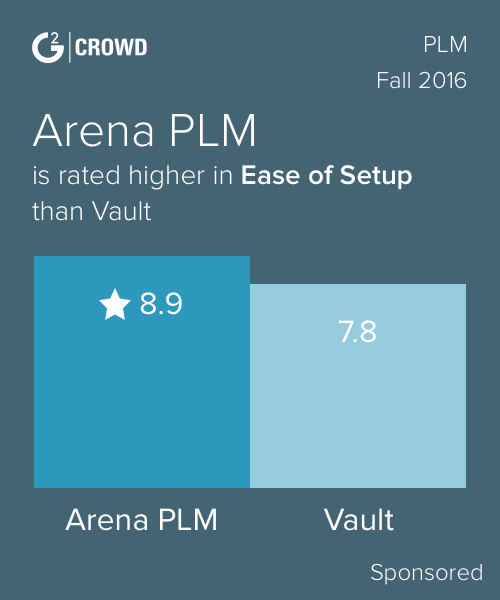 CAD management/vaulting. Benefits are minimal. It's been a painful process with the CAD phase that we have not expanded scope of the system. "Best in class PLM system"
Codeless customization, or simply configuration now days, is very nice with the BMIDE product for Teamcenter. Writing custom extensions in C or java are straightforward and powerful. The new active workspace (AWC) client is going to help with our fringe users who aren't in the system everyday. It provides a streamlined windows 8 like web client. I like this new direction and can't wait to see where it goes. Performance of the main rich client leaves a lot to be desired on standard business laptops. It's also not great at remote sites, however it is still useful. We recently switched database systems since Oracle RAC on IBM systems is no longer supported. This new oracle exadata system has help performance dramatically but Teamcenter is still designed to run on engineering hardware. I hope that the move towards active workspace overtakes this rich client within a few years as the main client. Having to take the system down to deploy changes can be a pain. Even simple list changes require a downtime, there is a mechanism to do this live, but it's still not recommended by Siemens. Being global we are 24/5 operation and have to schedule these on the weekends. We are a global company and now everyone can be on the same PLM/CAD solution. Previously we had many PLM systems that were not connected. Now that we are on one, we can enforce global process: change management, bom management and complete product lifecycle management. I manage the Engineereing Change portion of Teamcenter functionality: I find the ability to change and deploy workflows quickly a true advantage. A little background: Milwaukee Tool has had an established and highly successful NPD Process for years. Having had no experience with Teamcenter when we first considered a PLM system, it was a matter of translating that established process into Teamcenter terms and worklows. We minimized customization to maintain COTs to reduce need for third party coding - but could not completely eliminate it. As we have passed through the learning curve over the past year, it became evident that our original workflows were too "intense" and time consuming. Reduction of touchpoints anad decreased EC implementation time and User frustration. As Admin, because I continually use the system . . . I can't really pinpoint a "dislike" . . . oh, I take that back. I have issues with Subscribe. Users, however, complain about the following: a) it's not intuitive. b) Design Release Task is not connected to the ECR or ECN (you have to use Impact Analysis to find it) c) EC completion takes too long d) system is slow (could nap between picks sometimes) e) Multi-site configuration is a blessing and a curse. You need a simplified user interface. Frequent comment from Users is: Why can't it work like Amazon.com or Netflix?!?!? More intuitive, simplier dashboard . Milwaukee Tool/TTi is a large global corporation -- with locations around the world. Prior to Teamcenter, we used several CAD tools, a multiple databases, disjointed from the CAD, to release ECs, and exchange of CAD files and communications regarding design by email. All Users have a central hub, Teamcenter, to consolidate start of a new Design, maintenance of current product and 24 hr access/sharing for the Global team therefore reducing time to Market. "Teamcenter 8.3 rich client - Usage and application support experience "
Design Data Management, BOM management and specially variants. CAD integration with industry standard tools provide more flexibility to cad user in synchronizing CAD attributes in Teamcenter. Embedded visualization is always icing on the cake. 4tier Rich client installation process is cumbersome. Requirement of admin rights is something which is not acceptable by most of IT groups. The other area which is not as user friendly as it should be is _ MPP (Manufacturing Process Planner). For a manufacturing product engineer interface is way complex. 3. Teamcneter community and multisite provides a great collaboration. I have actively worked on lot many product configuration using effective and variants. Kind of features provided by tool is really efficient. "This product is used in my work for model management." I enjoy the CAD integration and organization that is controlled by Teamcenter. I use and older version for my work, Teamcenter 2007. It runs well and gets the job done. There are some errors that come with putting a status on a model, limitations that causes errors. There are also ways around those errors but the error report is too vague that the fixes are more tribal knowledge in my job that self deciphering issues. Teamcenter for me is used as a database for model and assembly control. The benefit of this is the obvious function of allowing me and coworkers alike to use the database to create and modify models. I like Teamcenter because it is a powerful tool for CAD and document lifecycle management and has the ability to integrate into many different CAD packages. The software developers are not careful enough when testing new releases for bugs. The Rich Client is not very intuitive/user friendly for infrequent users. Ability to keep organized, view CAD models, request doc changes securely. Streamlines correction process. Bulky program, lots of unused features, requires intensive implementation training. Have a strong implementation process and allow time for training. We use team center to assign projects automatically. It has created a more evenly distributed work load. "Teamcenter is an effective, if un-lovely, tool for product management"
Teamcenters open-ness means it will always need configuration and it takes strong management to keep this under control. The deployment process is a definite weakness, the build process is too manual and it is easy for steps to be missed. The UI is also in need of an overhaul - as well as looking quite old-fashioned, it relies on Java and there are common issues with screens not re-drawing properly and needing to manually refresh the screen at times. There is little functional difference between TC and the main alternatives - Windchill and Enovia. CAD integration remains a key consideration as do electrical design products and CAE. Depending on the rest of the IT Landscape and the product being replaced, TC's particular way of working and it's UI may make adoption more difficult than Windchill, which is web based and more modern. I have been involved with some very large and complicated TC programmes. In some cases, TC was replacing a legacy PDM tool that was no longer supported or it has been used provide a single tool for product management, replacing a collection of tools. In particular, ensuring consistency within an organisation has been a key goal - both in terms of process and data quality. TC has provided this, in one case ensuring transfers to ERP were 100% successful following deployment due to robust data checks and a rigorous process. Stable and reliable product, Good CAD Integration, It can support multiple CAD integrations. it depends a lot of java based clients, but now its moving out of java dependency. We use it for Product development and manage the entire product life cycle in Teamcenter. "Teamcenter for a global enterprise"
- Perform a PLM assessment using a 3rd party, document roadmap/ROI and execute to the roadmap. We are using Teamcenter for global design/engineering and collaboration. We have also extended Teamcenter to manufacturing shop floor. When I don't have to use it. When it works correctly. Very restrictive. Securities, ownership, and relationship ties. Difficult to work with pro-e/creo. Pick a PLM tool that works with your CAD software. Once something is saved into teamcenter it develops a spiderweb of relationships so if something is incorrect it can be impossible to fix. Very slow performance. You must choose the PLM software that is associated with your CAD tool. Any software from a 2nd or 3rd party will not be as good and not play nice. Keep everything simple. Use OOB functionality. Change all your company policies and procedures to work with the software. Plan on years of testing and development before rolling out in mass. Releasing engineering data with CAD associated. Benefits have been minimal, if any. Upper management still is asking when they will see ROI. Solving all engineering and designing on NX, easy concepts to grasp. "Siemens Teamcenter - A PLM tool"
Teamcenter helps in delivering complex and very large products while maximizing productivity. Teamcenter provides industry specific templates like Aerospace, Automotive etc. for better industrial integration. I like Teamcenter BOM Management, Document and Content Management, Lifecycle Visualization and Change Management modules, it got nice integration with various CAD systems available in the market. I do not like performance bottlenecks, FSC/FCC Cache issues, Database performance is very sensitive to hardware, software and DB configuration requires continuous performance monitoring and turning. Out of the box options are not suitable for production environments, need lots of tweaking. Need better integration with schematic software, better control with effectivity management, better ERP features like cost management, supplier portal integration apart from fixing performance issues. Complete automation of Change Management from the Defect to ECR to ECO to Release stages achieved electronically. "One of the Best PLM Tool to enhance and incorporate business needs"
- Helps to manage and store global data from single point location. - Offers customer-centric environment, which can be easily customized according to the business need. - Provides lot of interrogations to share and manage data. Nothing as such by far, submitted some enhancement request through GTAC. Will wait to hear further on the same. For current project utilizing Teamcenter as a PLM tool to manage Engineering Design Data Lifecycle. Makes life easy for Designers and manufacturing planners to access data and helps collaborating the tasks concurrently. "Pros and cons of Teamcenter as your PLM pacakage "
Creation of workflow to implement business process and also Teamcenter has built an T4S integration to establiash bi-directional real time integration. The production has very user friendly interface to create item objects and process those through workflow. Business Implenation process is lengthy and the ECO/ECR process doesn't support disposition of objects. you have implement the workflow for disposition. Its good PDM package to have but building brige with SAP can tricky. Depending on your volume of transaction data between SAP and Teamcenter you have build the process. No in-built batch process to transactional data exchange between the two system. Teamcenter has the following categories at its best . 3. Ease of integration with other ERP systems. 6. Lot of modules to suppot business like workflows, change process, Access controls, Documentations, organization.. There is not really much of dislike for Teamcenter as i feel. But the main thing i saw is the server scaling acording to the size of business and high level of planning before implemention is required. Make the switch and see the difference. We are addressing the following business needs. 4. Mutliple people around the world can work on the same design simultaneously. Revision control and ability to modify release process based on project type, especially useful on proposals and business development programs. Not a very usable PDM system for CATIA V5/V6 during the development phase, especially for concurrent users working with contextual design in a complex product structure. Great to use for release of engineering, but not very useful as a WIP enviroment for Pre-PDR development. Configuration control of released engineering that is to be manufactured and eventually certified. It's absolutely necessary to have in order to properly manage all the files and effectively release parts; however, it is not reliable. It's not reliable in that it has a lot of bugs and can freeze up all the time. This may be an issue with company add-on's and not TC's issue. Releasing of parts and drawings. Successfully tracking parts from start to finish with the appropriate sign-offs. "Teamcenter - oczy inżyniera elektryka"
I like a well-developed workflow module. The local client is embedded in the eclips, which makes it slow. Works only with a specific version of java. There are errors in the java code. Find a good consultant if you want to adapt the environment. "2 plus years in using siemens teamcenter for offroad client "
Centralized access of product designs, documents, BOMs and all data for my business. Bulky software consumes a lot of memory. It is one of the most important in Auto and off road &, truck manufacturing industry for connecting people with product and process knowledge, powering collaboration across the product lifecycle. The data storage and the size of all the files is what makes team center a great software to use. This also helps in saving me lot of time in retrieving the files. The user interface is bit boring and I would like to see some changes in the same. I would say , this could move towards ENOVIA in having a global interface rather than sticking towards the teamcenter. "I am a user, an administrator, and a developer customizing Teamcenter"
Teamcenter offers an environment which enables integrated CAD and CAE for electrical/mechanical design and simulation (analysis), which makes concurrent engineering efficient. Also Teamcenter offers API's for client and server customization. Installation tool can be more friendly and systematic / network based. It's tough to configure a 4-Tier envirnoment with multiple servers involved. Sometimes, a parameter has to be set once on each server by the installer, which is not reliable. We use Teamcenter mostly to manage our design and analysis engineering data and build product BOM. We mostly benefit from its capability of integrated CAD and CAE capabilities. In a Teamcenter Part Item Revision, a CAE part can reference a CAD part. I'm sure this is a very robust system, but darn it if I cant check things out if I'm not a super user. I dont like how fragile things seems, I feel like 1 wrong clip and im going to screw up my factories production. Get proper training in place. Trying to get all of our folks on the same page for CAD/part information. "OK software but a pain to train people on"
It is a pain to train new employees to use this software. It does not seem like there is a good structure to the search function of this software. Engineering problems mostly. The benefits are that we can save and come back to the drawing. "Teamcenter can help enterprise get product fast to the market"
Teamcenter consists of a collection of applications of Product Life Management helping enterprise with fast delivery of new product from concept design to engineering change; from manufacture to service. Though many of functions are provided by Teamcenter, certain amount of customization are still required for most customers which can add cost and time into the project. In the world of engineering design, inevitably there're many iterations of engineering changes which frequently affect design in complex collaboration. By using Teamcenter, such engineering design information are efficiently managed and easily shared with entire enterprise. Quick response to issues we had with lighting or basic problems. Greatly helped us manage our HVAC & energy mgmt system. Saved us thousands of dollars & helped us to keep techs honest. EMS & repair & maintenance monitoring for HVAC systems nationwide. Used to hold techs accountable. The full-featured capabilities. The Robust backbone and built-in best practice information model. Very complicated to tailor and configure. Few knowledgeable professionals for Teamcenter Unified. It is one of the most scalable PLM systems out there. Performance is key aspect which seems to be an issue when implemented across a broad userbase of 8000+. Debug becomes complicated and challenging. Install setups and managing OTW's installs via insweb is sometimes tricky when migrating between different platforms. Involved in multiple implementations and support/maintenance/monitoring of application. "I love Siemens Teamcenter Software"
Ease of use, especially when coupled with NX software. GTAC makes it easy to use when people run into problems. Can occasionally be difficult to admin, especially for those new to the product. However, GTAC is a great support service that makes life much easier for new users. This product works great with any CAD software. We are using Teamcenter for CAD/CAM/CAE management with NX. Our biggest benefit has been with write protection and keeping all of our data organized. The power and uses of thus software are tremendous! There are so many features and tools that many never get fully utilized or implemented. It has all the feature to develop & manage your engineering cad data. This works with solid edge and which don't have simulation package. Product design and development, special purpose machine. Rich client environment which is easy to use on Windows and other platforms. Lots of legacy code in C which I consider it is not very up to date implementation. We use that product to manage the user profile and link with document URLs. "Teamcenter is a robust PLM software which has good integration with NX"
The ability to easily open drawings and part pictures on my laptop. application engineering involves solving problems you sometimes can't even think of. * We monitor all Siemens Teamcenter reviews to prevent fraudulent reviews and keep review quality high. We do not post reviews by company employees or direct competitors. Validated reviews require the user to submit a screenshot of the product containing their user ID, in order to verify a user is an actual user of the product. Hi there! Are you looking to implement a solution like Siemens Teamcenter?